I contacted Brendon after a catastrophic back injury and nearly a year’s worth of physiotherapty still left me with chronic pain. Although I knew I needed a strength training programme, I didn’t know how to structure a programme for injury rehabilitation and I was afraid of reinjury. Brendon’s experience with injury rehabilitation put me at ease immediately. He recognised my imbalances and set about correcting them. I’ve been training with Brendon for about a year and a half now. Back pain is mild and extremely rare. I am no longer training with rehabilitation as a goal, but instead strength and fitness. Training with kettlebells is incredibly efficient. Fitness comes on fast and the workouts feel more effective than “traditional” gym-based workouts. Brendon keeps things interesting and fresh — his workouts are never a dull routine. He is incredibly patient and helpful, explaining proper technique and suggesting modifications when necessary. I’ve learned a lot working with him and highly recommend his services to anyone looking to improve their fitness.Christine Switzer Ph.D. I had got to the stage where I thought I would never get fit again. 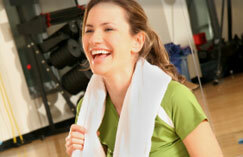 Like many women I found working out at a gym all too boring and too disheartening. Brendon’s help has changed all of that. He worked with me to develop an exercise programme which is challenging, fun, suited to me as an individual and which he takes me through in the comfort of my own home. He is a great motivator, has understood when I have had problems and his sense of humour means the programme is never boring. Exercise has become the highlight of weekly routine. I feel fitter, firmer and healthier – the only “drawback” has been the need to replace clothes that have too much room in them! I have competed at the national level of fencing since I was 15yrs old, but when I went to do my physiotherapy degree I did not have enough time, so I quit for two years. Last summer I started to compete again, however due to no muscle strength or cardio endurance I really struggled. I developed a back problem due to lack of muscle strength, so that when I started training with Brendon. We did a variety of strength and fitness training, which has really helped with my fencing, strengthening the specific areas I need to fence at a higher level. I did not have a national ranking at the beginning of the season 2005. By December 2006 I had won a Bronze medal at the Commonwealth Games and achieved the no.1 Great Britain ranking for Women’s Foil. I really believe that my training with Brendon has contributed to my success. Elizabeth Wright – Bronze medal winner Women’s foil Commonwealth Games 2006. I contacted Brendon in 2007 after missing most of the domestic international touch rugby season due to injury.I told Brendon my targets: fix my injuries; strenghten my weak areas; and get quick, powerful and fit for the 2008 season.The first thing that impressed me when I first met Brendon, was the research he had done to prior to the meeting and the ideas he had about the work I needed to do.He had a clear plan for both my injuries and the my sport, based on what he had researched and what I had told him.Our working relationship was a bit different from most clients and their personal trainers, in that Brendon designed my overall training program rather than take me for individual sessions.This meant that not only did he have to plan carefully, but he also needed to provided me with adequate education and resources for me carry ou the training independently.Over a nine-month period Brendon guided me on a programme that firstly adressed the injuries and chronic weaknesses I had, moved into making me generally stronger and fitter, and finally into sports-specific training designed to get me peaking at the right times.I benefited hugely from the resources Brendon gave me, his availability when I needed advice, and his enthusiasm and interest in my progress.The program he designed was interesting,challenging and relevent and most importantly it worked! When the season started I was injury-free, my fitness was excellent and I was the fastest, most explosive and sharpest I had been in years.Brendon has also armed me with the knowledge of how to structure and plan my training for the best results.I would recommend Brendon, to anyone from club level weekend warrior to international athlete, or even if you just want to get fit and have fun doing it. Simon Ebbett -Touch Rugby International since 2006. Brendon has been my personal trainer for almost 3 years now.His enthusiam and expertise have not only enabled me to become fitter and stronger, but have changed my attitude towards physical activity so that I am more active generally than I used to be.I enjoy training with kettlebells because of the variety of ways in which they can be used and the results I have experienced from using them.I have recommened Brendon to my family and friends, many of whom are now also enjoying the benefits of training with him. Rosalind Ritchie.Edinburgh. I have been working with Brendon Hartt now for more than a year and our sessions together have improved both my physical fitness and my sense of well-being to an extent I would have not predicted.I first started training with him to prepare myself for a two-week in the Alps last summer.Since I am in my mid-sixties, and had not been taking regular exercise, it was a steep learning curve.But Brendon’s carefully worked combination of fitness exercises meant that I was able to complete the walk and climbing involved, and I am now training with him again.I can strongly recommend Brendon as a fitness trainer. Magnus Linklater.Edinburgh. I was referred to Brendon by my Physiotherapist. who recommended that embark on a rehabilitation training program after suffering a bulging disc in my back.Brendon intially concentrated me on exercises which strengthen the body’s core muscles to help support my spine.Once I was stronger, he began to work me on exercises to improve my general fitness.After only a few sessions I felt that I had greatly improved and also gained confidence to move around more and do more normal activities again.As well as providing fitness expertees, Brendon is also very supportive and always willing to consider his clients’ views. Stephanie Russell.